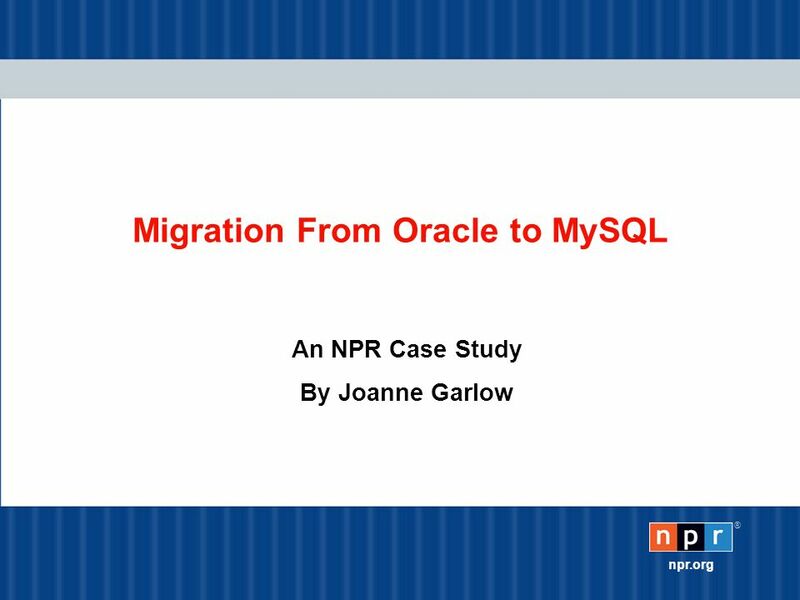 ® npr.org Migration From Oracle to MySQL An NPR Case Study By Joanne Garlow. 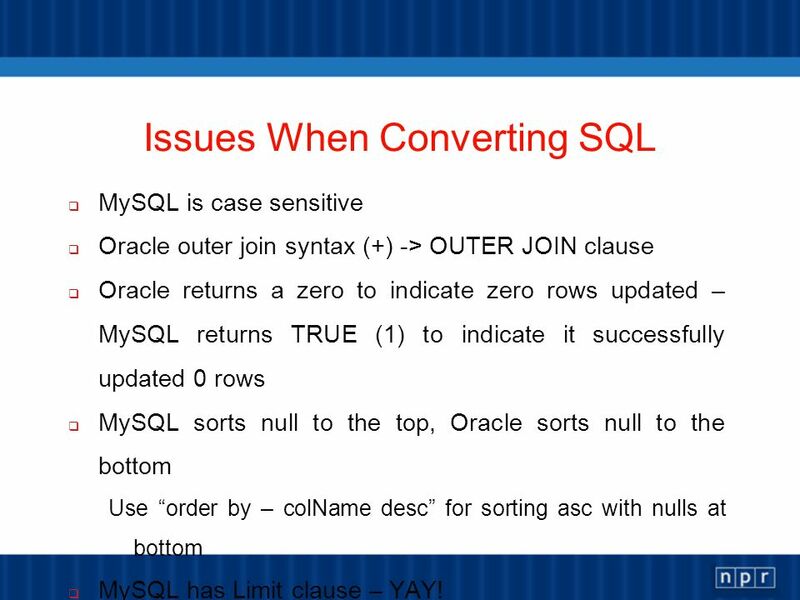 9 Issues When Converting SQL MySQL is case sensitive Oracle outer join syntax (+) -> OUTER JOIN clause Oracle returns a zero to indicate zero rows updated – MySQL returns TRUE (1) to indicate it successfully updated 0 rows MySQL sorts null to the top, Oracle sorts null to the bottom Use order by – colName desc for sorting asc with nulls at bottom MySQL has Limit clause – YAY! No sequences - DOH! Continued…. 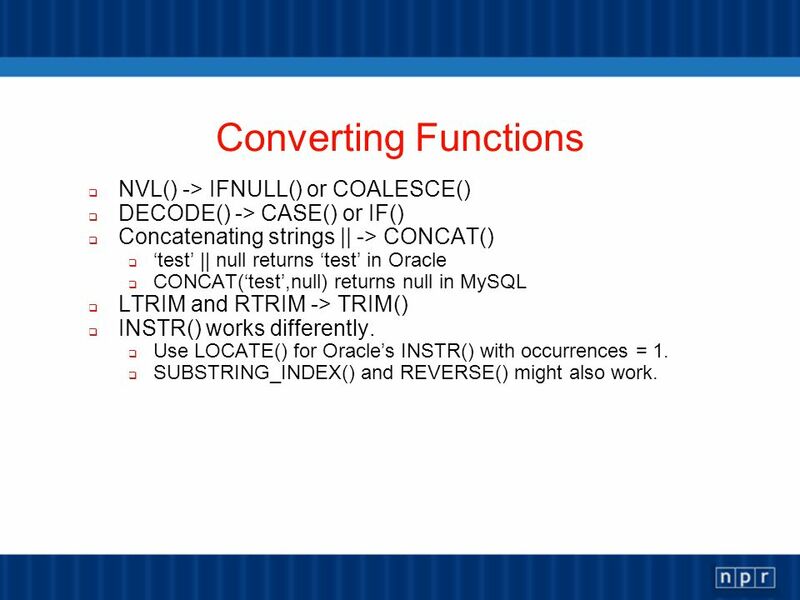 12 Converting Functions NVL() -> IFNULL() or COALESCE() DECODE() -> CASE() or IF() Concatenating strings || -> CONCAT() test || null returns test in Oracle CONCAT(test,null) returns null in MySQL LTRIM and RTRIM -> TRIM() INSTR() works differently. Use LOCATE() for Oracles INSTR() with occurrences = 1. SUBSTRING_INDEX() and REVERSE() might also work. 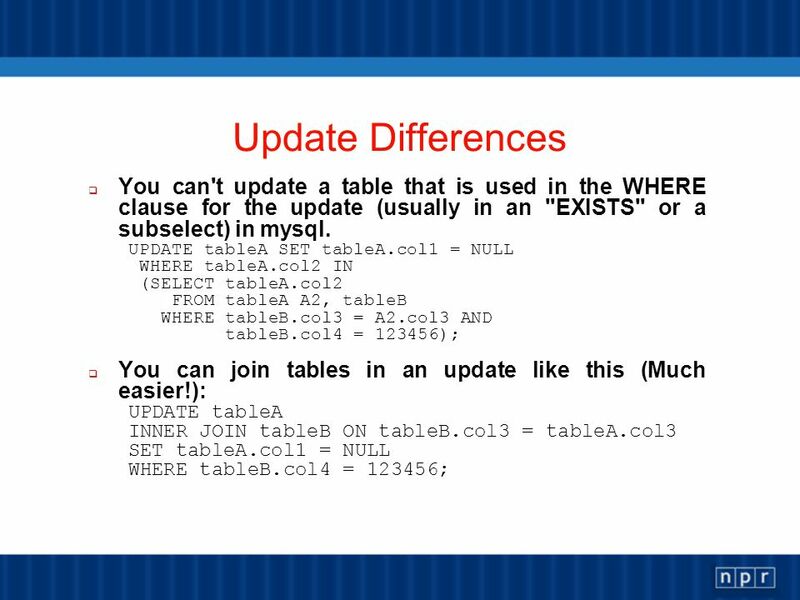 16 Collation You can set collation at the server, database, table or column level. Changing the collation at a higher level (say on the database) wont change the collation for preexisting tables or column. 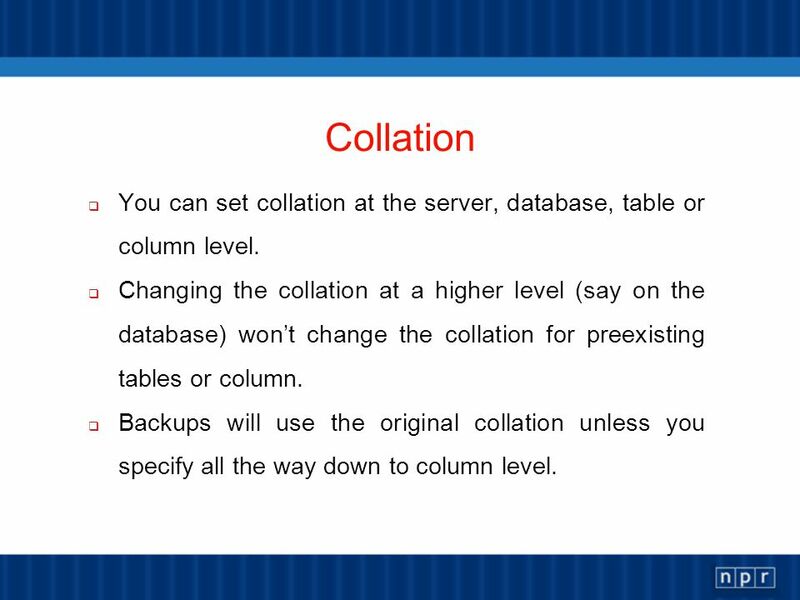 Backups will use the original collation unless you specify all the way down to column level. 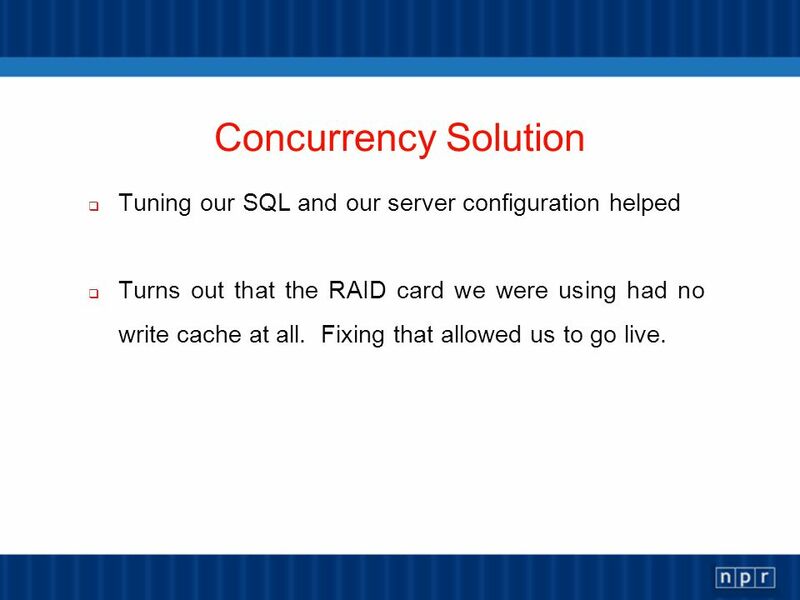 21 Concurrency Solution Tuning our SQL and our server configuration helped Turns out that the RAID card we were using had no write cache at all. Fixing that allowed us to go live. 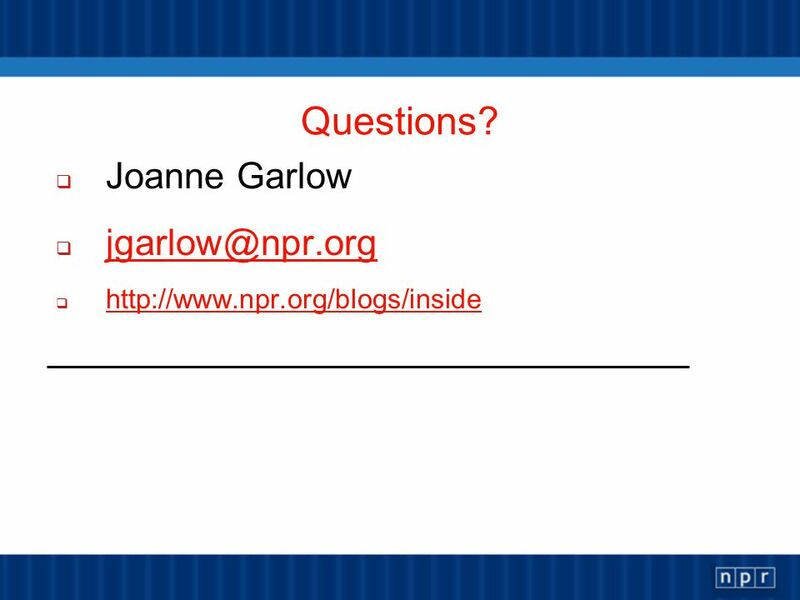 Download ppt "® npr.org Migration From Oracle to MySQL An NPR Case Study By Joanne Garlow." 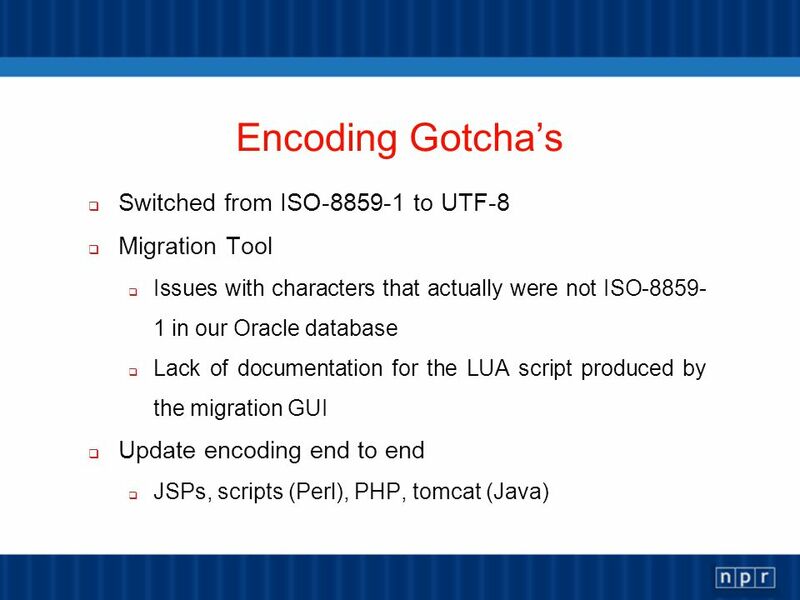 Copyright © 2003 Pearson Education, Inc. Slide 8-1 The Web Wizards Guide to PHP by David Lash. 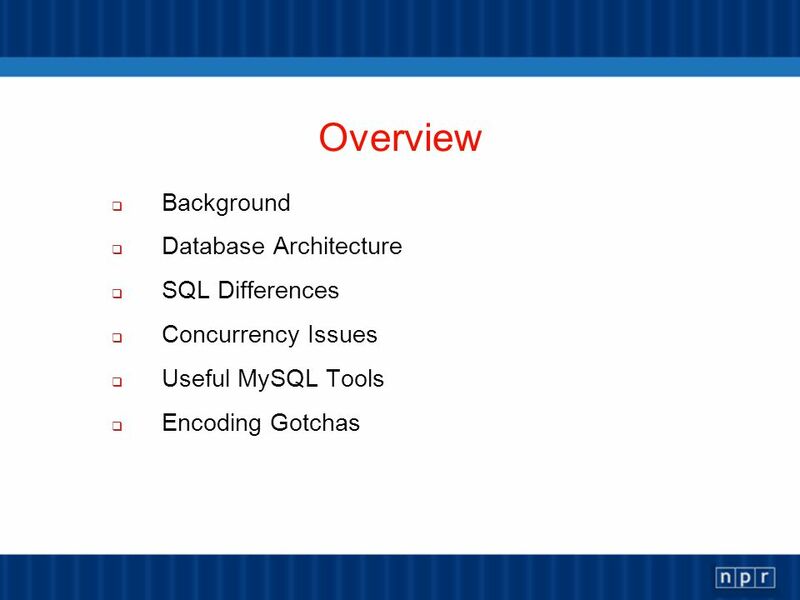 Ashley Ohmann June 20, * What is Custom SQL? * What can I do with it? * Join conditions * Unions and Self Joins * Ranks * Derived Tables. 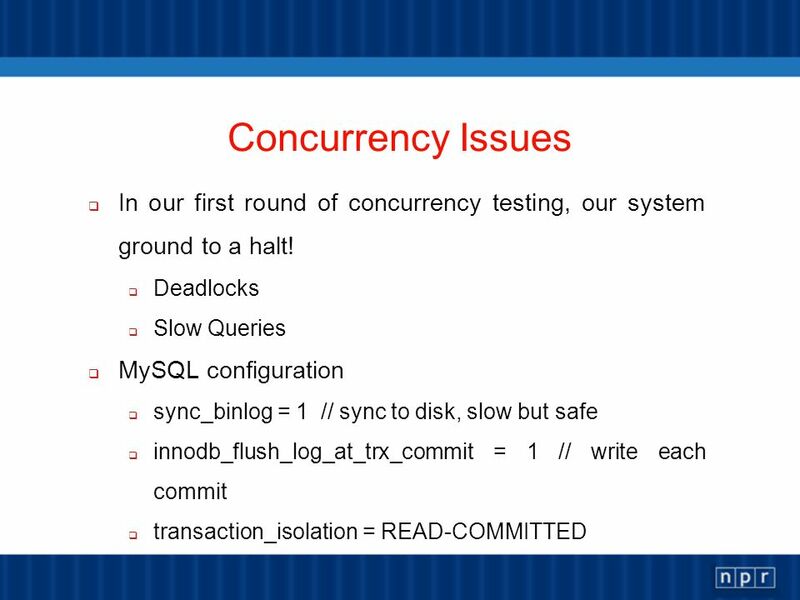 Drop in replacement of MySQL. 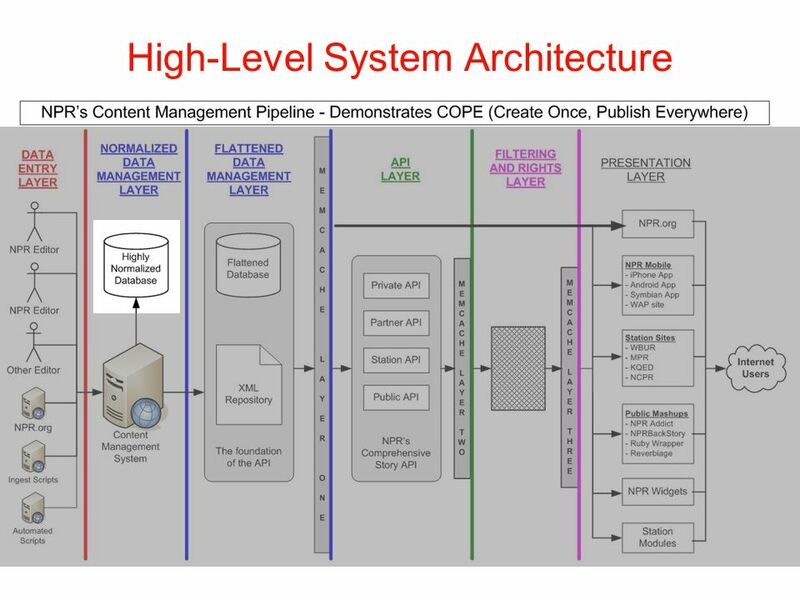 Agenda MySQL branch GPL licence Maria storage engine Virtual columns FederatedX storage engine PBXT storage engine XtraDB. PHP Hypertext Preprocessor Information Systems 337 Prof. Harry Plantinga. 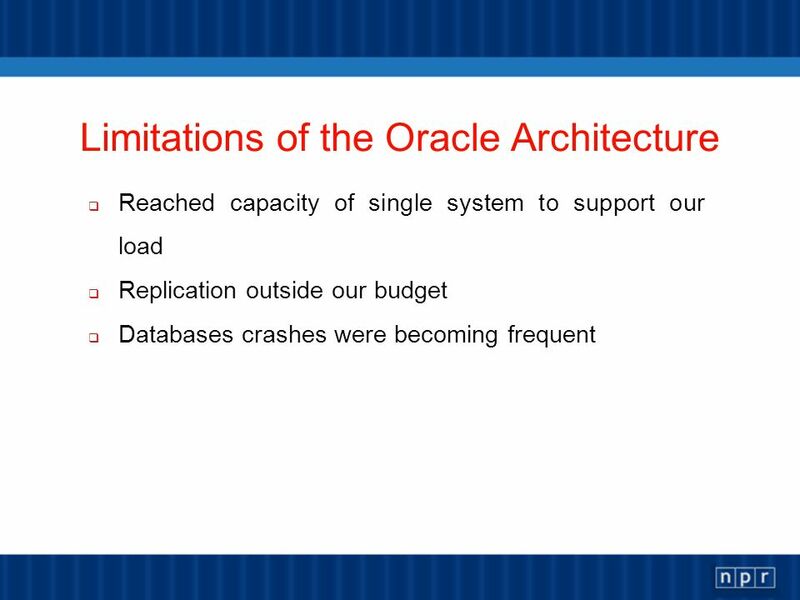 A comparison of MySQL And Oracle Jeremy Haubrich. 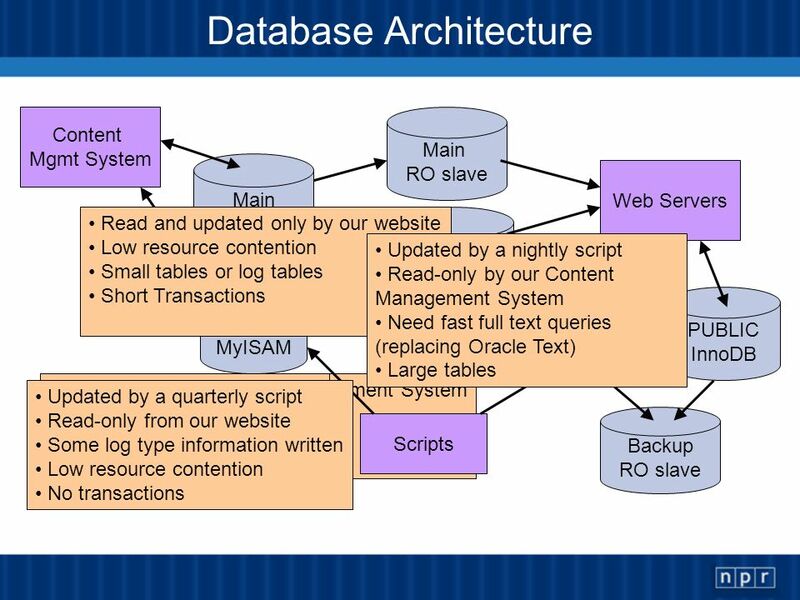 2010/11 : Building Web Applications using MySQL and PHP (W1)MySQL Recap. 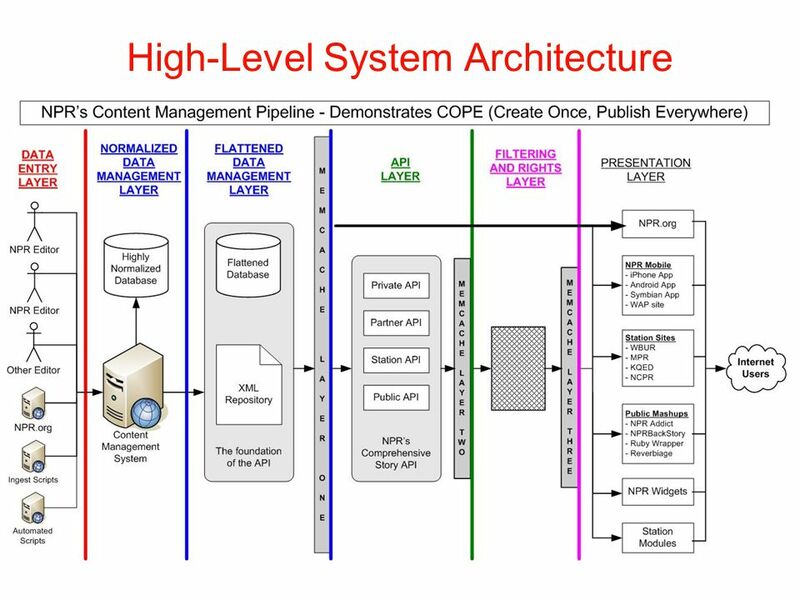 PHP (2) – Functions, Arrays, Databases, and sessions. 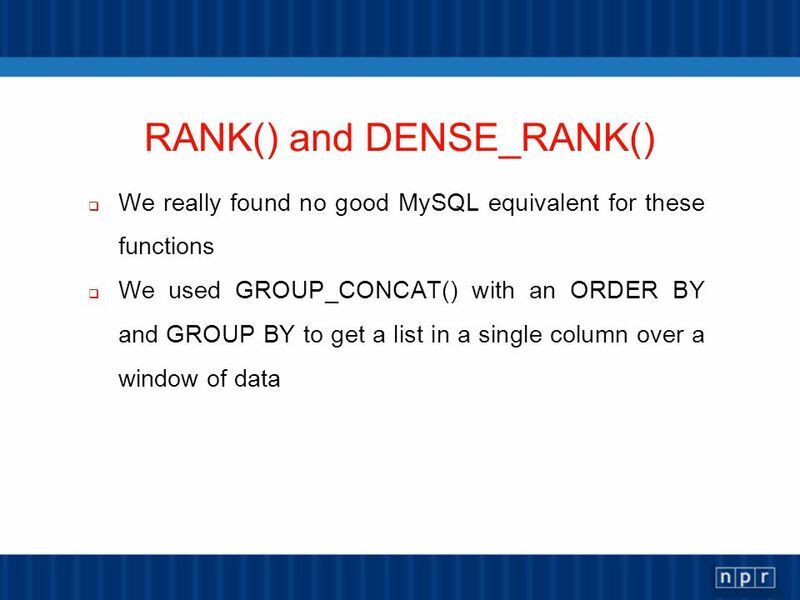 A Guide to SQL, Seventh Edition. 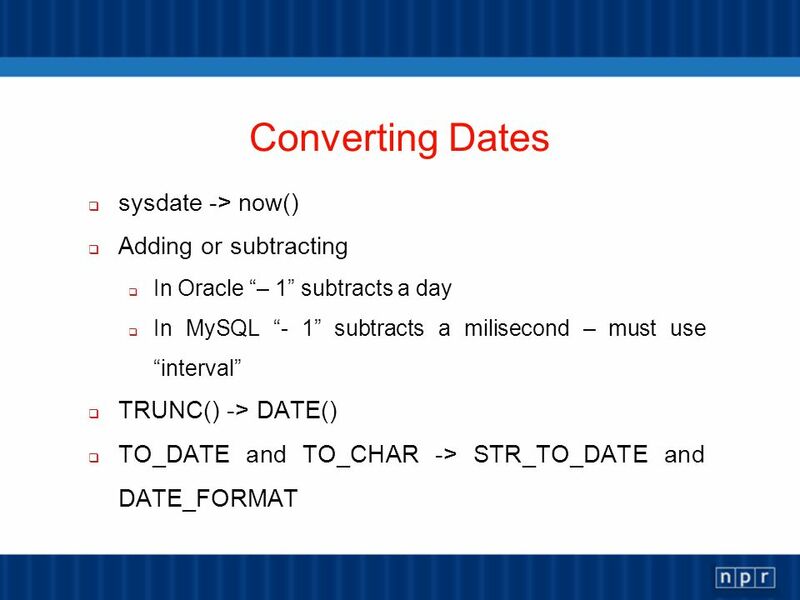 Objectives Create a new table from an existing table Change data using the UPDATE command Add new data using the INSERT. 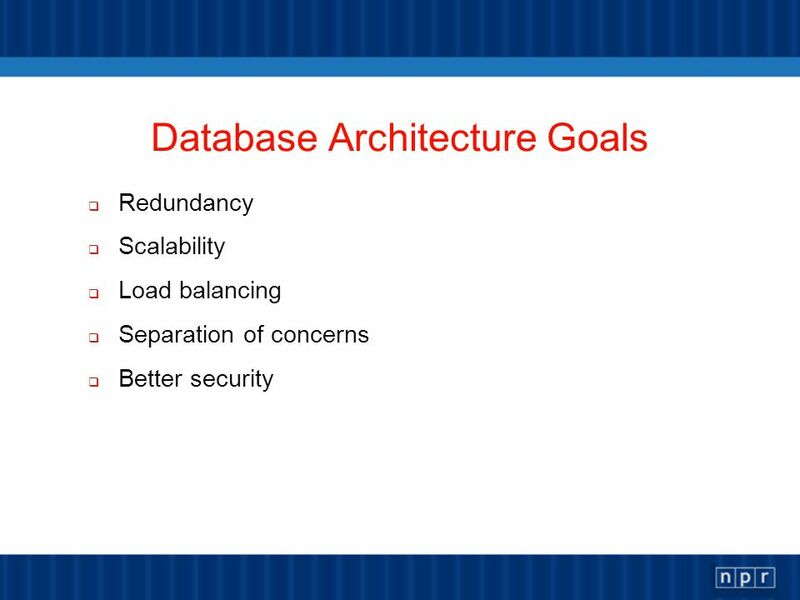 Fundamentals, Design, and Implementation, 9/e Chapter 11 Managing Databases with SQL Server 2000. 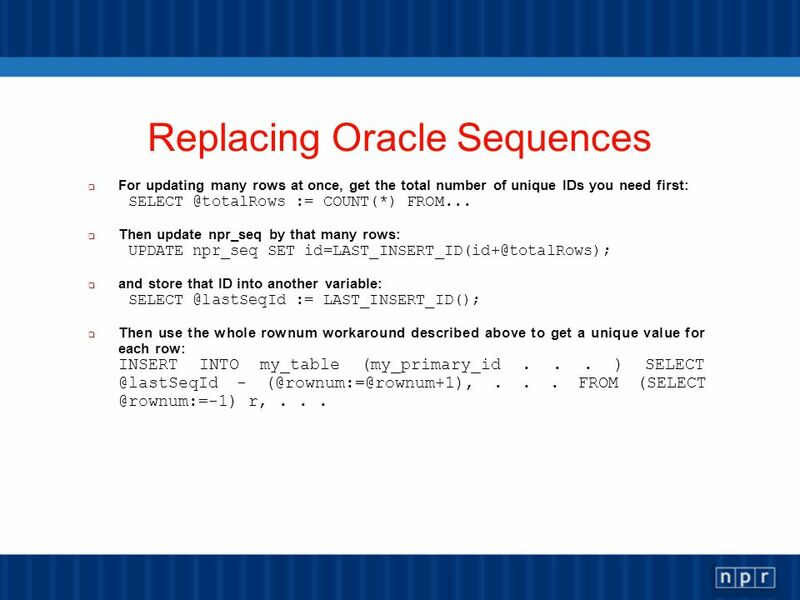 Introduction to Oracle9i: SQL1 Selected Single-Row Functions. 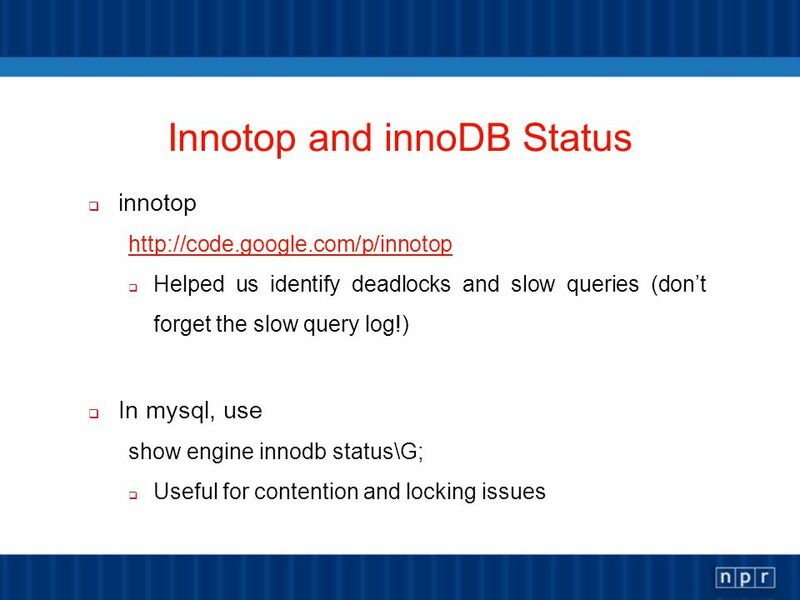 A Guide to MySQL 3. 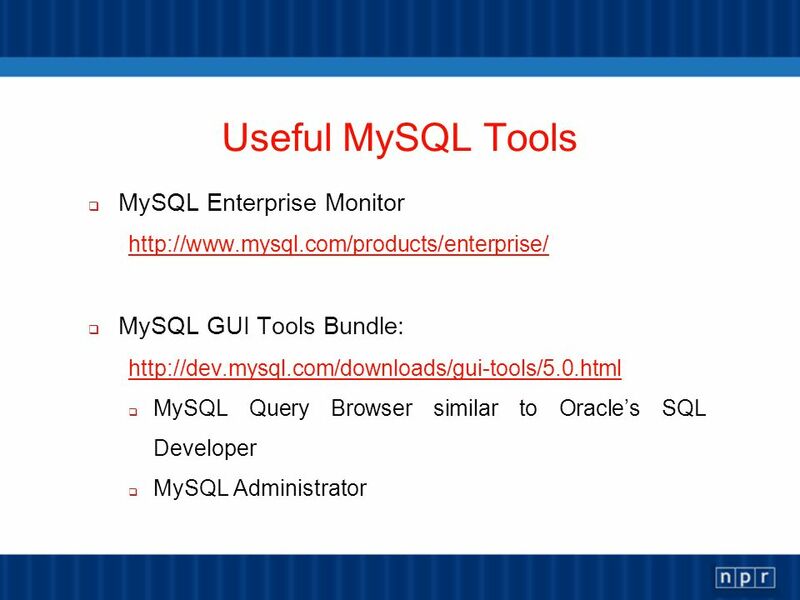 2 Objectives Start MySQL and learn how to use the MySQL Reference Manual Create a database Change (activate) a database Create tables. Chapter 7 Managing Data Sources. ASP.NET 2.0, Third Edition2. 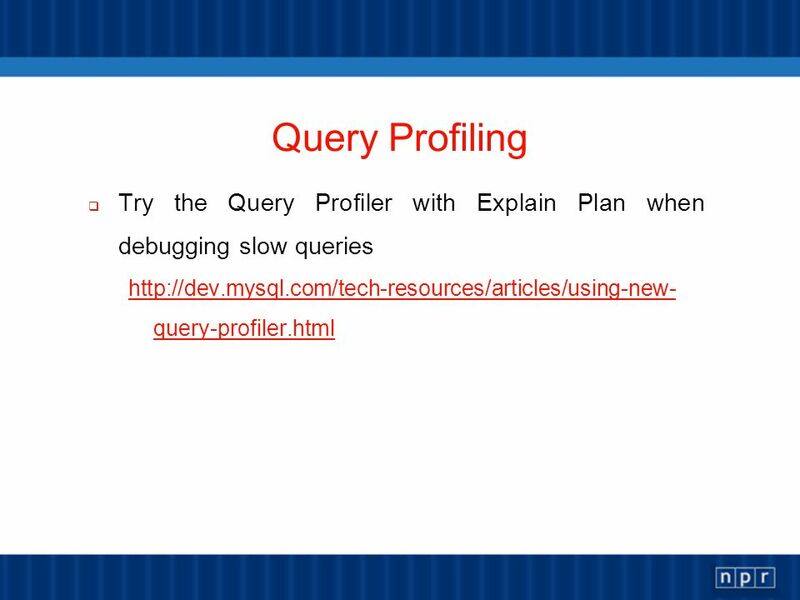 Phil Brewster  One of the first steps – identify the proper data types  Decide how data (in columns) should be stored and used. 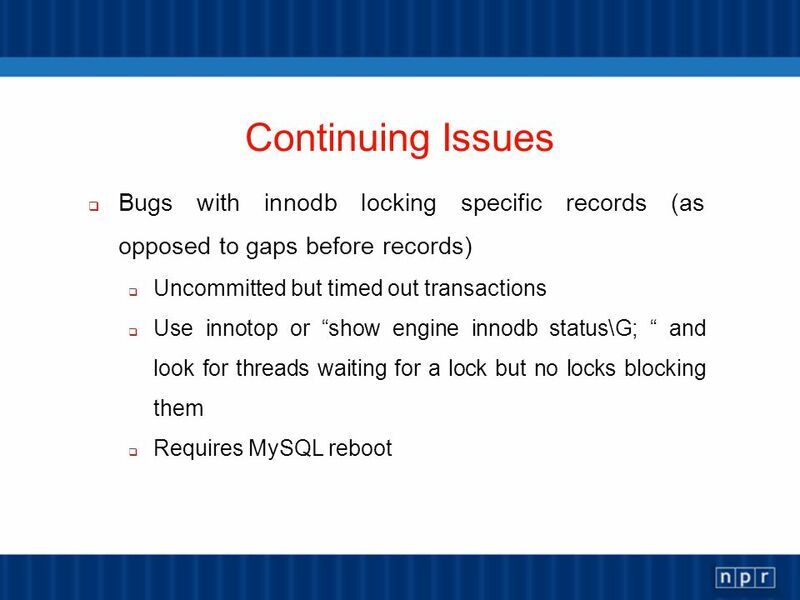 Introduction To Databases IDIA 618 Fall 2014 Bridget M. Blodgett. 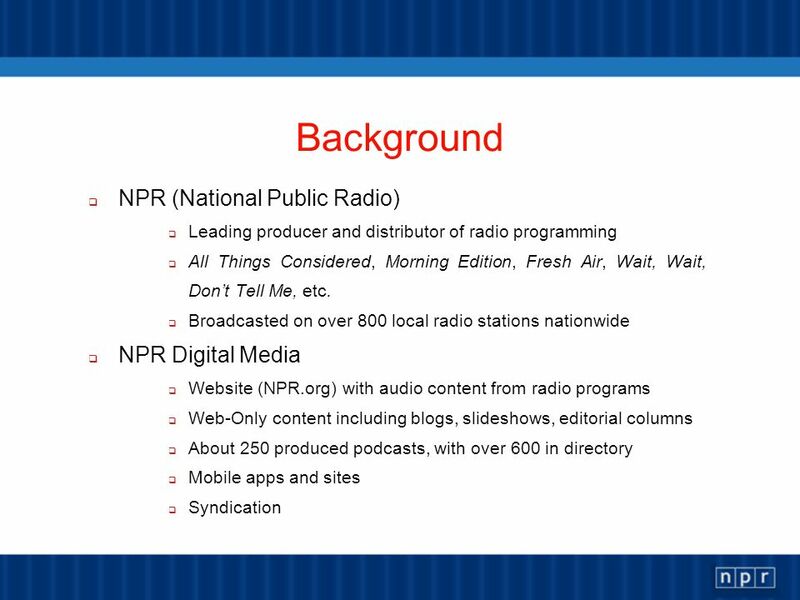 Open Content By Daniel Jacobson and Harold Neal National Public Radio. 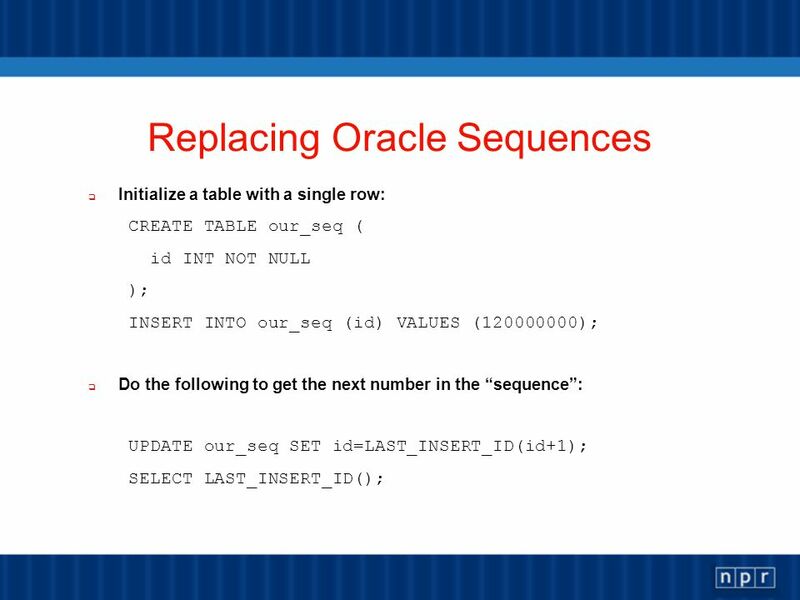 A Guide to SQL, Eighth Edition Chapter Three Creating Tables.